Before we begin, some quick housekeeping on the blog. I apologize for not posting last week. I’d like to give some valid reason for that, but I don’t. Laziness and the Super Bowl. That’s it. Sorry. However, my eating did not abate! Therefore, expect two posts, in addition to this one over the next week. ‘S’ is for sandwich, because it definitely doesn’t mean spicy. For this post, we’re thankfully moving on from the unholy combination burgers of the last few weeks. Burger King just released a Spicy Chicken Sandwich. From the commercials it appears to be like their Original Chicken Sandwich, except spicy. As a long time fan of the Wendy’s Spicy Chicken Sandwich and the style of Burger King’s Original Chicken Sandwich, this one had me really excited. Our base here is already good, so we could only improve, right? For a change of pace, I decided to dine in the restaurant this week. I wasn’t sure if taking the food home had been causing problems in previous weeks, and I didn’t want to take a chance. Of course, it took so long for my food to be prepared that they actually apologized to me. That never happens. Anyway, another medium meal this week, costing $8.07. I’d have liked it to be cheaper, since this is not a large sandwich, but I was full at the end of the meal, so I can’t complain too much. 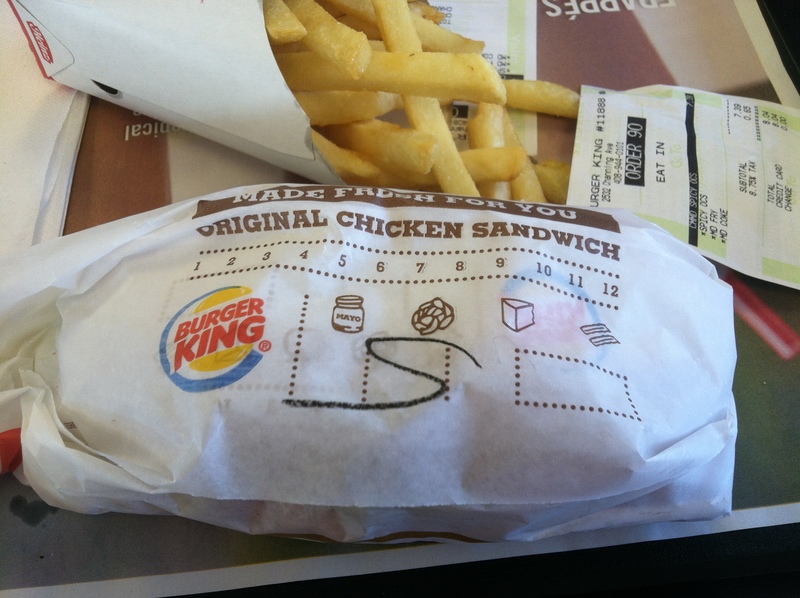 The sandwich came in the standard paper of the Original Chicken Sandwich with a black ‘S’ written on the paper. When opened it looked…. exactly like the Original Chicken Sandwich, but the chicken was a reddish color. The patty was a bit too small for the oblong bun, but not overly so. Some shifting of the patty allowed for no chickenless bites. 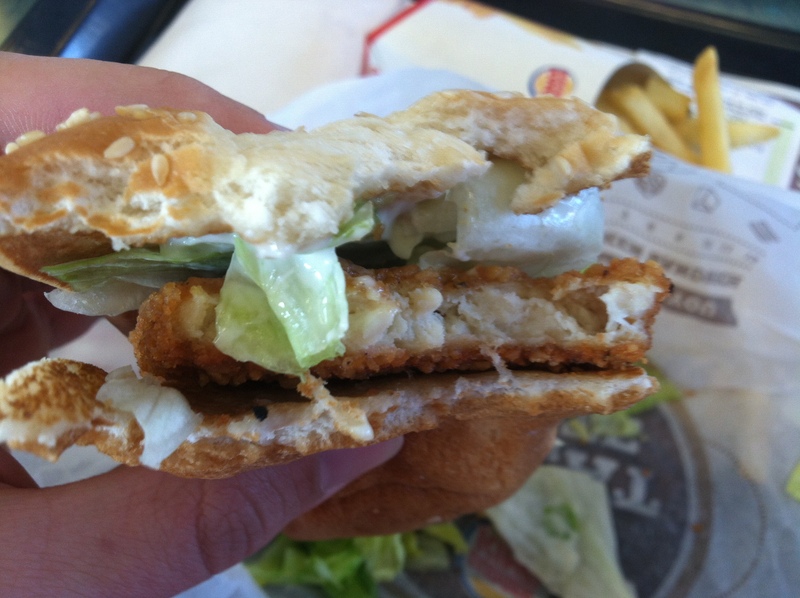 Burger King describes the Spicy Chicken Sandwich as “made with white-meat chicken and a light breading mixed with cayenne and black pepper. 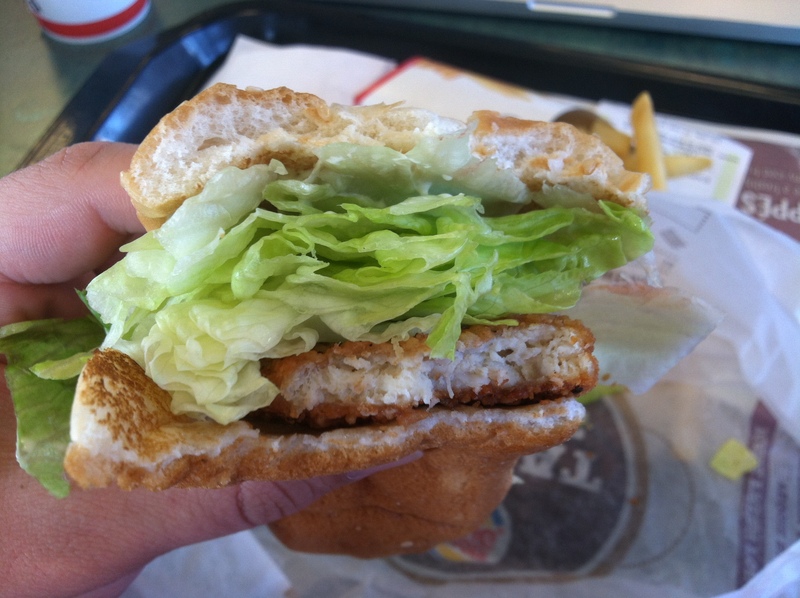 Topped with a simple combination of fresh lettuce and creamy mayonnaise and served on a toasted sesame seed bun.” My first bite was good! It tasted exactly like the Original Chicken Sandwich. And I mean exactly. No spice. Chicken was still juicy and crunchy, but I really couldn’t tell the difference between this sandwich and the Original Chicken Sandwich. For my final bite, I made sure it was just chicken, and still no spice! Perplexing. 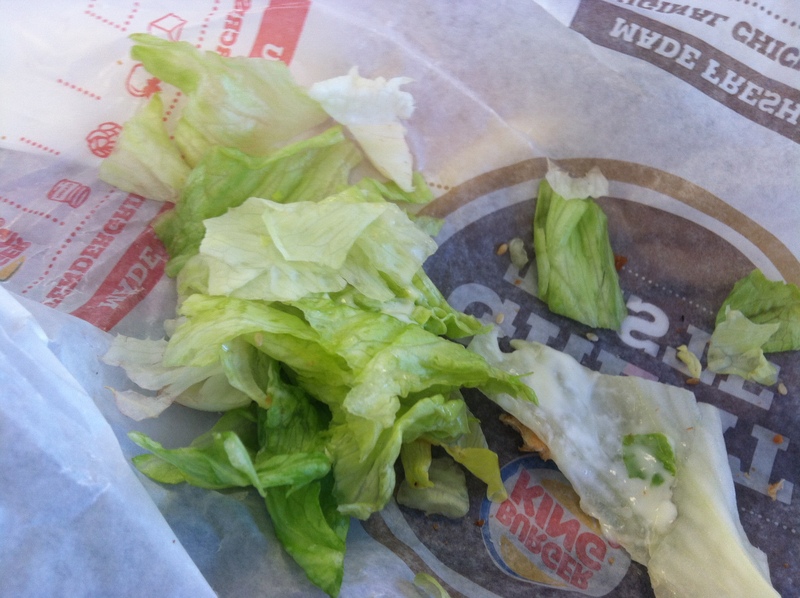 In addition, there was waaaay too much lettuce on the sandwich. Maybe there was extra to serve as a cooling agent for the spiciness of the chicken, or maybe the lettuce was just carelessly strewn by someone who does not take pride in their sandwich work. However it got on there, it shouldn’t have. 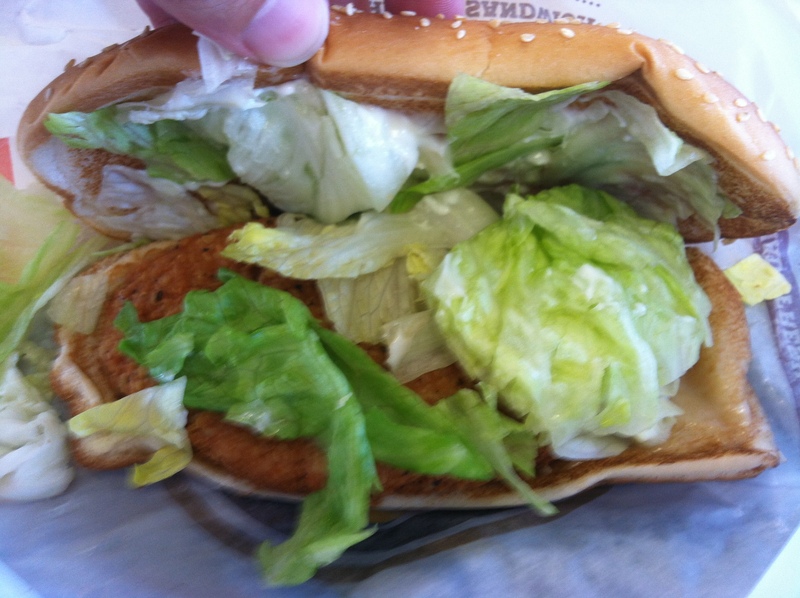 As you can see from the picture above, there was twice as much lettuce as chicken. I had to drop a bunch of it just so I could taste the other components of the sandwich. So this a mixed reaction. 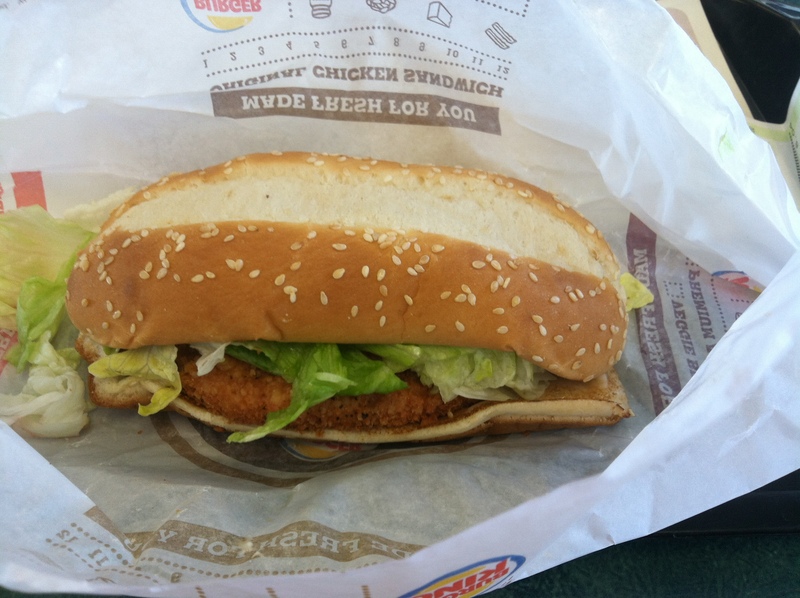 As I mentioned, I like the Original Chicken Sandwich, and if you like it too, you will like the Spicy Chicken. However, if you order this expecting some actual heat, either don’t bother, or bring along some hot sauce (and I do like the imagery of people ordering this with bottles of Sriracha or Crystal’s or Frank’s in their hands). So we took a positive step this week. Hopefully the next post contains an unqualified approval. This is a really bad review. 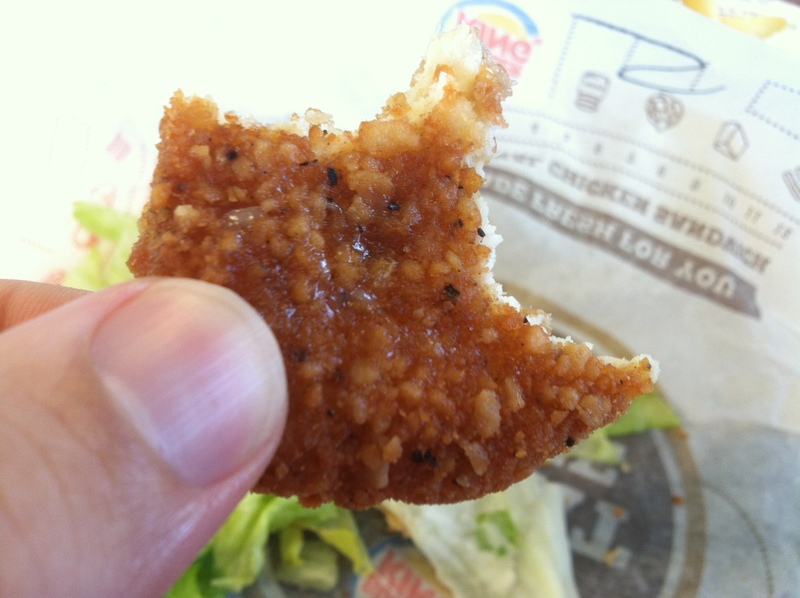 Burger King has always had a Spicy Chicken Original, years and years before this review was written. Are you sure you weren’t inhaling drugs at the time of this review? Please seek help. Thanks for the comment! I was not inhaling drugs when I ate the sandwich, nor when I wrote the post three years ago. I appreciate your concern and will write better reviews in the future.